Click on each photo to view it larger. The 5 key items you’ll need to recreate my DIY Tangled Rapunzel costume are: a pink+ purple dress, a blonde wig with a long braid, a stuffed chameleon, flowers, and exaggerated freckles. A frying pan is also an option! I realize that's not an option for everyone, but for my high school friends reading this — you may want to try shopping the adult and children sections in the Halloween stores. Sometimes the children's fit is surprisingly large, so don't rule out at least trying them on! Another option if you don't want to spend much is to purchase a long purple dress from a thrift shop. Glue or stitch pink ribbon to the front to mimic Rapunzel’s look. Poshmark is also a great app for finding inexpensive dresses. (Use code ETINTEXAS to get a $5 Poshmark credit!) Mercari is another excellent app for finding inexpensive costumes and clothes. Rapunzel wouldn't be Rapunzel without her long, blonde locks. If you have long blonde hair or own extensions, you could do a side braid similar to the one I did here. If not, you'll need to buy a wig or create one out of yarn. Here's an easy yarn hair tutorial from The Everyday Mom Life that would work great! If you’d rather buy, here is a really long option from Amazon, and here’s a great shorter option . Since my name is Daisy, I added lots of daisies to enhance my braid. I picked them up from the craft store, and I snagged the smaller purple flowers from my mom's scrapbook collection. Use a hot glue gun to attach the flowers to bobby pins so they'll stay in the wig all night. I added exaggerated freckles because I wanted a cutesy, costume-y look for Halloween. 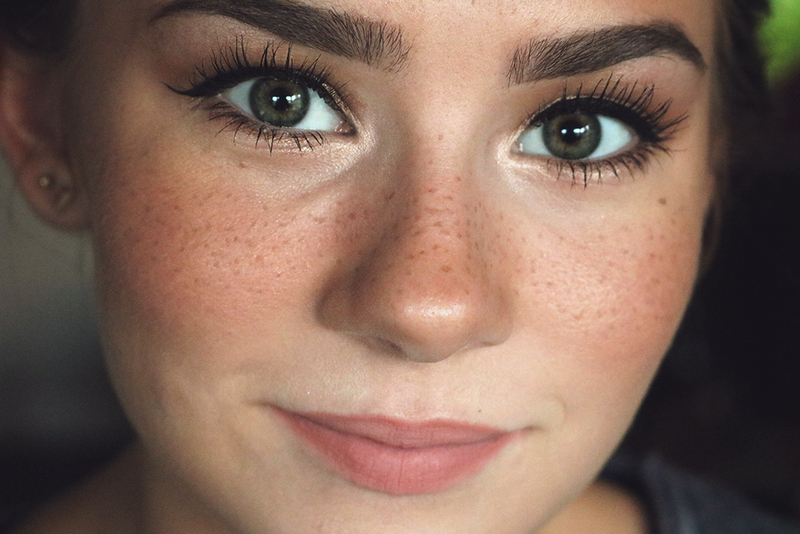 If you've never added freckles before, check out my faux freckles tutorial. (There's a video to go with it.) They're very easy to do! It's easy to add freckles using eyeliner, or a product made specifically to mimic the look of freckles! 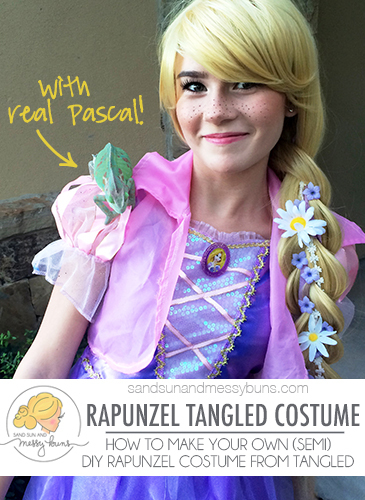 Let’s face it, Pascal is the real star of the movie…and the costume! You can pick up adorable stuffed Pascal options from Amazon and either pin one to your shoulder or attach it using velcro or a hot glue gun. I posed for pictures with my pet chameleon, but I didn't take her trick-or-treating with me. Chameleons are really sensitive (and fragile) little critters, so it wouldn't be safe to take her out at night and have tons of kids attempting to hold her. Need More Rapunzel Tangled Inspiration? (Photo sources at end of post) If I ever get married and have a baby, I'm going to beg my family to go as a Flynn Rider/Rapunzel/Pascal combo. Seriously…it's the cutest costume idea ever! For the finishing touch, you can add the frying pan that Rapunzel used on Flynn. 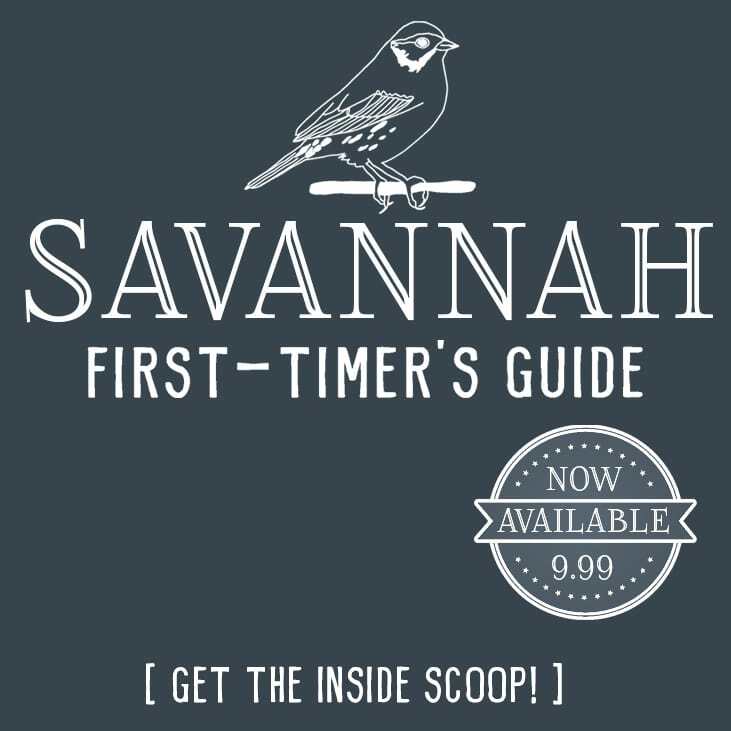 You may only want to use it for pictures, because it might be a pain to carry around a heavy frying pan plus candy all night. Brigitte Bardot: Here's a hair tutorial and a makeup one. I also recently added a Brigitte Bardot video to my YouTube channel. Let me know in the comments what you plan to be for Halloween this year and if you need any makeup tutorials! Thanks! I like the freckles, too. I add them every day just for fun bc I love them so much! This came out really well! I think the hardest part for me would be finding the right style of dress. I can’t fit in childrens costumes anymore, unfortunately. How cute is this!!! I love this costume. I LOVE this costume! This is one of my favorite Disney movies! So cute! your chameleon is so cute!